Are these the souvenirs I left behind? Last week’s blog talked about some of the things we have brought home from Paris. But I have also left behind many fascinating and varied things. I have photos of some, but even when I don’t, their memories are still vivid enough to make me smile. If I left them behind, are they still souvenirs? Consider the Buffalo Bill Tir de Salon (Shooting Gallery) that I did not buy. I still think of it fondly. The Tir de Salon jumped out at me as Philippa and I ambled through the Porte de Vanves Flea Market on a beautiful Saturday morning in August. A French toy drawing on the allure of Buffalo Bill, the great American showman who romanticized the American West, did not seem at all unusual. I was prepared for the sight by Jill Jonnes, a historian whose work I admire. While I was researching and writing The Canadian Niagara Power Company Story, I read Jonnes’s Empires of Light: Edison, Tesla, Westinghouse, and the Race to Electrify the World. It was such a wonderful book that when I saw she had written about my favourite engineer/entrepreneur Gustave Eiffel in Eiffel’s Tower and the World’s Fair Where Buffalo Bill Beguiled Paris, the Artists Quarreled, and Thomas Edison Became a Count, I read it immediately. Buffalo Bill Cody had arrived too. “Under Cody’s powerful spell, the French were even willing to try snacking on the pink and white popcorn balls sold at Wild West refreshment stands. This was no small gustatory concession, for the French had long held that corn (maize) was a food fit only for pigs.” (p. 125) Interestingly, my father, who had grown up in Saskatchewan, had the exact same view, to the chagrin of my mother. As I look at my photos, my CD player brings back another element of that day at the Porte de Vanves. I am listening to Roland Godard et Son Piano à Tout Faire. 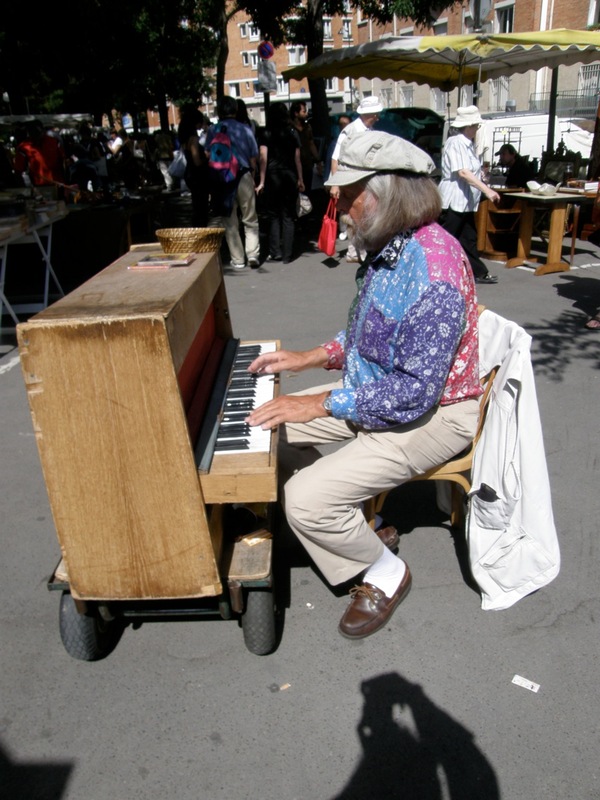 That morning I could hear him playing his portable piano as I examined the Tir de Salon. 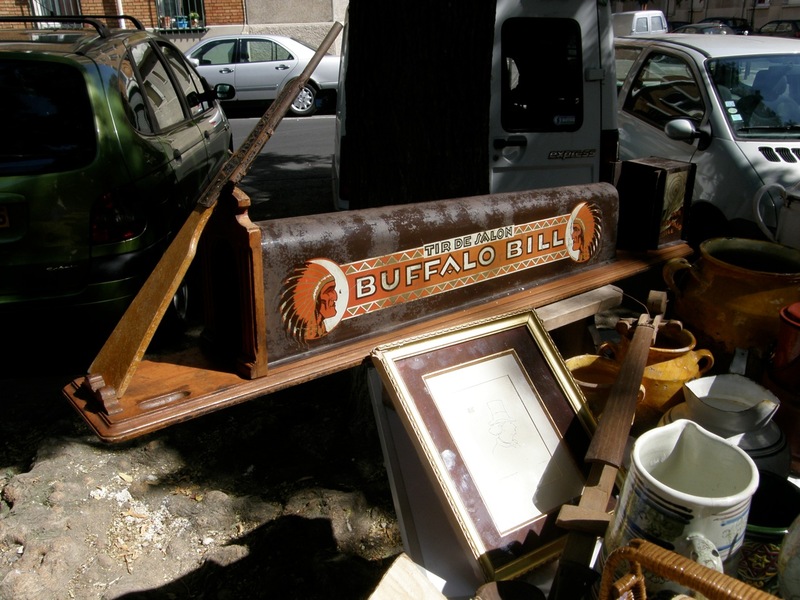 With my jumbled but enthusiastic French, I chatted to the stall owner and we soon had a small crowd around the booth listening to tales of Buffalo Bill, Indians, horses, and Wild West encampments at Neuilly. The vendor even offered to reduce the price, but at some point he knew I was not going to buy it. Then the moment of truth. To my “Monsieur, est-ce-que je peux prend un photographie?” he countered with “Dix Euros, Monsieur.” I responded, “Ah Monsieur, c’est trop. Soyez gentil.” He motioned favourably. I showed him the photo in my camera screen, we shook hands and parted. I hope the Tir de Salon went to a good home. Then Philippa and I talked to Roland Godard for a while, bought a CD, and browsed at a few more stalls. At one point, we looked down at the traffic on the Periphérique from the bridge over the highway and realized we were out of the 14th arrondissement and had entered the Ville de Malakoff. In a small café we had something to eat and tried not to appear too interested in a group of knife dealers or collectors who were displaying their wares to one another amid much discussion and admiration. The Buffalo Bill episode lasted no more than 4 or 5 minutes. But these curious experiences are an important part of our visits to Paris and of our reasons for coming back as often as we can. We recently spent our first Christmas and New Year’s in Paris and it too gave us new experiences, stories and memories. As we chatted with the owner, the item below caught my eye. It is a fine example of a very specific genre of cookbook published in the 1930s, when electricity was being introduced to people’s homes. The purpose of such books was to help customers feel more comfortable with domestic uses of electricity and thereby increase the demand for electricity. I told the shop owner about my research on a Canadian electric company that had had its own appliance showroom, a cooking school and three home economists on staff for the same purpose. I wrote about this in The Canadian Niagara Power Company Story as well as in “Electricity From Niagara Falls: Popularization of Modern Technology for Domestic Use” in a book of essays titled Covering Niagara: Studies in Local Popular Culture. 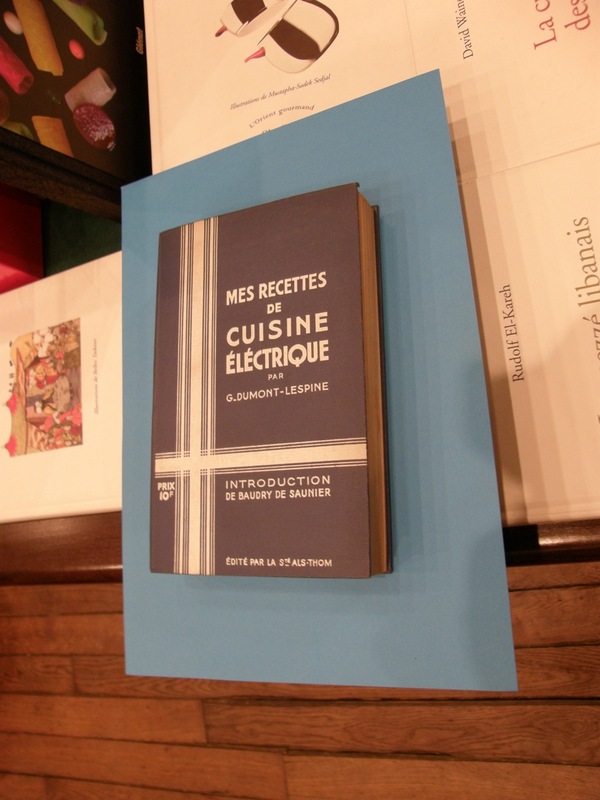 This genre of cookbooks is fascinating for the variety of recipes of the period, as well as the constant references to electricity. Our host seemed pleased to have someone in the store who appreciated such an unusual book. I had a camera and was told I could take a photo of the book cover and given a copy of his most recent catalogue. Oh yes, and we also purchased several items (fodder for a future blog). A third unbought souvenir also comes to mind from our recent visit. One day between Christmas and New Year’s Day, we accompanied Marie and Michel—friends from Normandy—to the Musée Rodin. 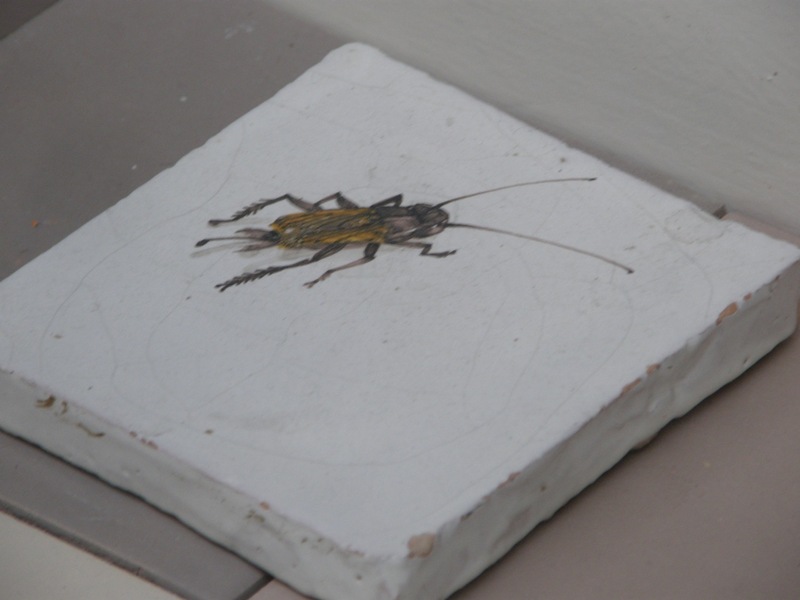 On the way, we passed a ceramic tile business. I think our friends were a bit surprised by what had caught my eye. This is something we might have bought, but the shop was never open the whole time we were in Paris. It would have been fun to leave it lying about or perhaps use it innocently as a coaster. But perhaps it would be a bit too much for some people. But did they get away? Are they souvenirs or not? The expression “avec mes meilleurs souvenirs” translated as “with kind regards” or with best regards. In the province of Quebec, the motto on the license plates is “Je me souviens,” which for many is more than a simple “I remember” – it is an emotionally charged reminder to think of larger issues in Quebec history and of the French in Canada. Memories, photos, stories and associations are an important part of our souvenirs in this sense. Some of these souvenirs are tied to physical things we have brought back. Other souvenirs are more about the memories we recall, talk about and share with others. So these three souvenirs never got away; we have them still. This entry was posted in Paris bookstores, Paris flea markets, Paris popular culture and tagged Annie Oakley, Buffalo Bill, Canadian Niagara Power Company, Covering Niagara, Eiffel's Tower, Empires of Light, flea markets, G. Dumont-Lespine, Gustave Eiffel, Jill Jonnes, Mes Recettes de Cuisine electrique, Paul Gaugin, Porte de Vanves, Remi Flachard, Roland Godard, rue du Bac, Tir de salon, Ville de Malakoff. Bookmark the permalink. 3 Responses to Are these the souvenirs I left behind? any idea of the age of this toy? I’m still searching…..
Hello, you stiil have it?